Fender Squier Stagemaster (Floyd Rose - Humbucker) $150 shipped. Hey guys, I took this in on trade yesterday. 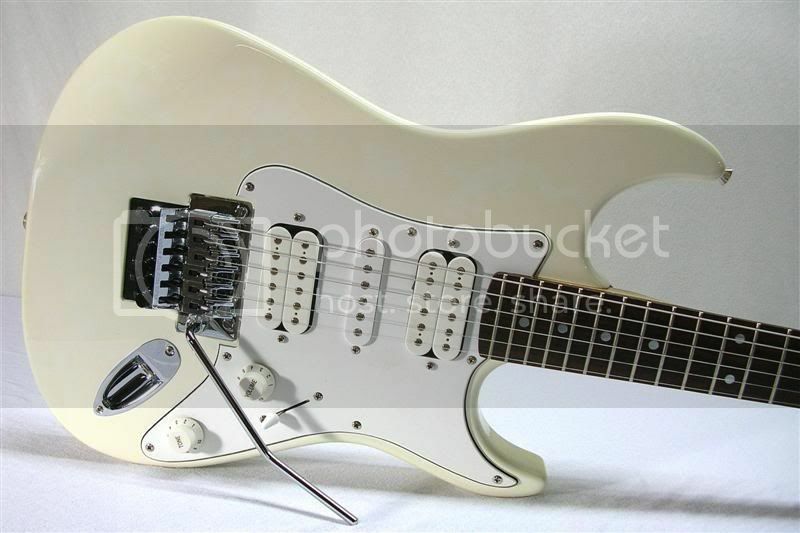 These are somewhat of a rare guitar (you don't see them everyday) and what's cool about is it's like a modded (Fat Strat). The neck is slim, not like the typical rounded C-shape Strat neck, License Floyd Rose locking tremolo and double humbuckers. The pickup (as you can see in the pictures is HSH) It reminds me of a Dave Murray's legendary 1957 Strat that he used back in the 80s. This one is white. I just replaced and setup the guitars for 10 gauge strings last night. So she's all ready to rock-n-roll! Re: Fender Squier Stagemaster (Floyd Rose - Humbucker) $150 shipped. o man if this is still here by the time i get my new job i want it haha i will let you know $150 shipped is a good price...but i do have a question the crack by the neck is that just the paint??? ahhh ic well that would be one reason i would get it for the floyd rose i always wanted something with one and never had a chance to get one would it be fine with it if maybe i put some of that copper paint in the pickup cavity maybe?? ?